On February 12, 2014, a catastrophic sinkhole opened up at the National Corvette Museum (NCM) and swallowed in it eight rare Corvettes. Since then, a diverse team of professionals has been working together with the NCM, led by Scott, Murphy, & Daniel, LLC Construction, to assess and remediate the collapse. As part of this effort, Western Kentucky University (WKU) and project partners are collecting data to research the various environmental factors contributing to the cause and evolution of the sinkhole, as well as monitoring the area during the remediation. These types of collapse features are common in karst regions, like south-central Kentucky, where water flows underground and forms caves and voids as it dissolves away the bedrock. Since water flowing underground is part of the process of sinkhole development over geologic time, and often difficult to research since it exists underground, a method to monitor stormwater and groundwater in karst regions that can capture high-resolution data about water movement is necessary. 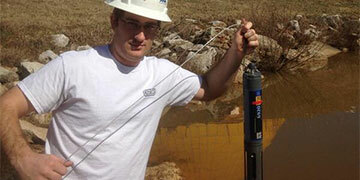 Recently, YSI, designed a new, submersible water monitoring sonde, the EXO2, which is capable of capturing and logging high-resolution (every 10 minutes in this case), continuous data for several parameters, including water depth, pH, temperature, specific conductivity,turbidity, dissolved oxygen, and others. This logger provides everything from Bluetooth accessibility to real-time monitoring capabilities with additional peripheral devices that are available, and can be used in wells, streams, or any other water monitoring location. 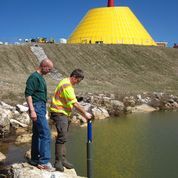 Through a partnership between WKU’s Center for Water Resource Studies (WKU CWRS), Fondriest Environmental, YSI Incorporated, the City of Bowling Green Public Works Department, and the National Corvette Museum, one of these EXO2 sondes outfitted with multiple water parameter probes was loaned to WKU CWRS for use at the NCM sinkhole site. 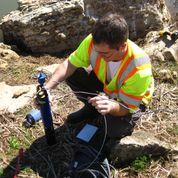 The sonde is being used to monitor water in an adjacent pond area that serves to collect runoff and exists as a perched water feature, which can provide information as work continues of any changes in the water from the drilling process and storms that could pose a threat to the remediation process. This monitoring provides an additional measure of safety and data collection to help understand the dynamics of the sinkhole and its natural formation processes. The data collected through this monitoring project will support efforts by DDS Engineering, Hayward Baker Incorporated, EnSafe, Scott, Murphy & Daniel, LLC, and other project partners in their collective work to remediate the sinkhole. It will simultaneously providing invaluable scientific information to WKU CWRS research on sinkhole processes and karst landscape evolution. Special thanks to Paul Nieberding (Fondriest Environmental) and Brandon Smith (YSI, Incorporated) for their assistance in making this project possible. For more information please contact: Dr. Jason Polk (jason.polk@wku.edu), at 270-745-5015, or @ProfJasonPolk on Twitter. How Does Real-Time Data Save You Time?